As soon as an event is published, job of the publisher is done. No matter whether any subscriber has worked on it or not, the event just dies down. OSGi Event Admin doesn’t fare well with clustered environment. Sling Job mechanism takes care of these shortcomings and is persistent(persisted under /var/eventing/jobs). It guarantees delivery and comes with lots of configurable options like number of retries and retry interval. In AEM 6.1 release notes, Adobe recommends using this new Eventing mechanism as old eventing has deprecated. Here addJob method takes 2 parameters(same as event service) – job topic and properties. Consumer subscribes to that job topic and processes it. In case of successful execution, JobResult.OK should be returned. In case there is some issue in execution but you need to keep job for retry, use JobResult.FAILED, else use JobResult.CANCEL that cancels the job right away. 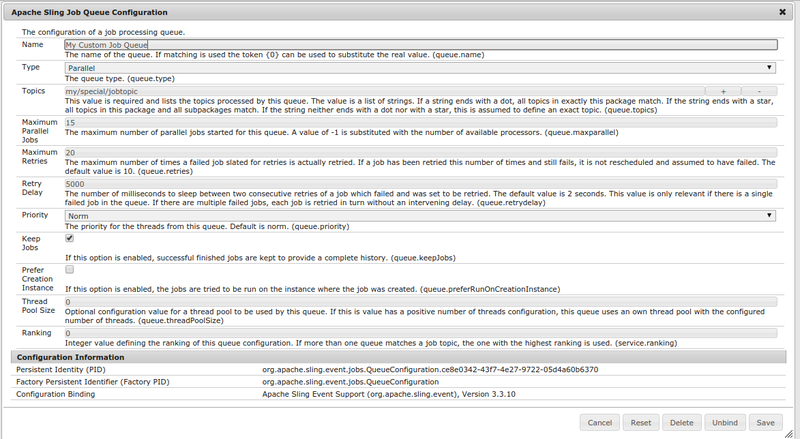 “Apache Sling Default Job Queue” maintains default configuration of the queue. We can also maintain a separate queue for a pool of job topics that we create. “Apache Sling Job Queue Configuration” is a factory configuration that takes care of this.